Zucchini season has arrived! 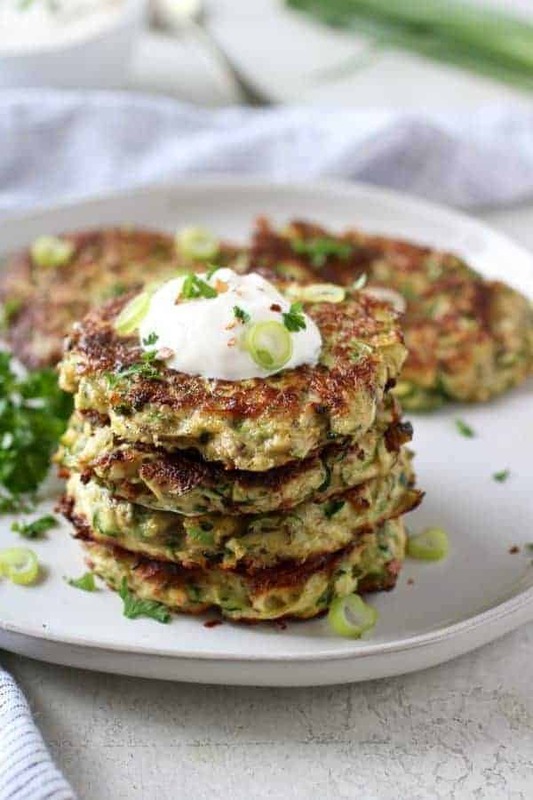 These Savory Zucchini Fritters will make a delicious addition to your zucchini recipe collection. It’s that time of year when zucchini is in full bloom and is likely making a regular appearance on your menus. Don’t get me wrong, I love zucchini! It’s a versatile vegetable that can be used in both sweet and savory recipes. It can be shredded, cubed, sliced, diced, zoodled, baked, grilled, sautéed, you name it…it can be done. I haven’t grown a garden for that last two summers, yet I still end up with all the zucchini! I’ll be honest, there have been many zucchini seasons where I’ve become a wee bit tired of it. Garden growers are giving it away all around us. In fact, if you hit up the last hour of a Farmers’ Market, there’s a good chance you’ll be taking home some free zucchini. So this year, I’m on a mission to find new and tasty ways to use it up! 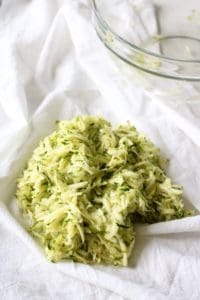 With all of the zucchini recipes out there, there’s really no reason anyone should get bored of this non-starchy, versatile vegetable, which is why I’m sharing a zucchini recipe with you today. 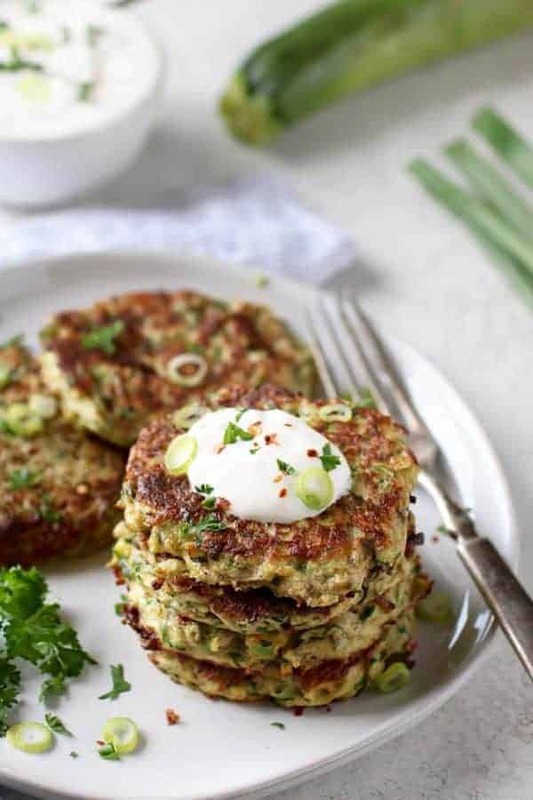 Savory Zucchini Fritters are a tasty and easy way to put a dent in your zucchini supply. 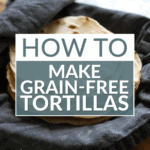 They’re crispy, flavorful and quick to make. 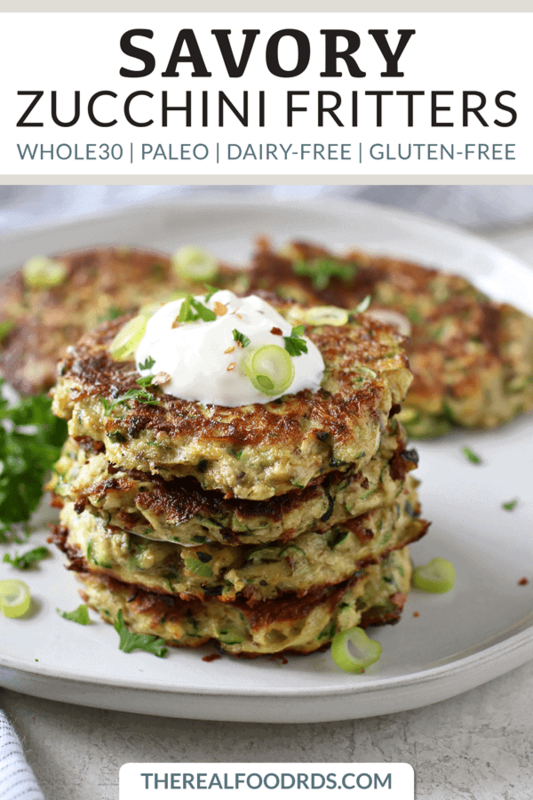 Made with less than 8 ingredients, these Whole30 & Paleo-friendly Savory Zucchini Fritters will make a fast-and-easy, downright delicious addition to any meal. 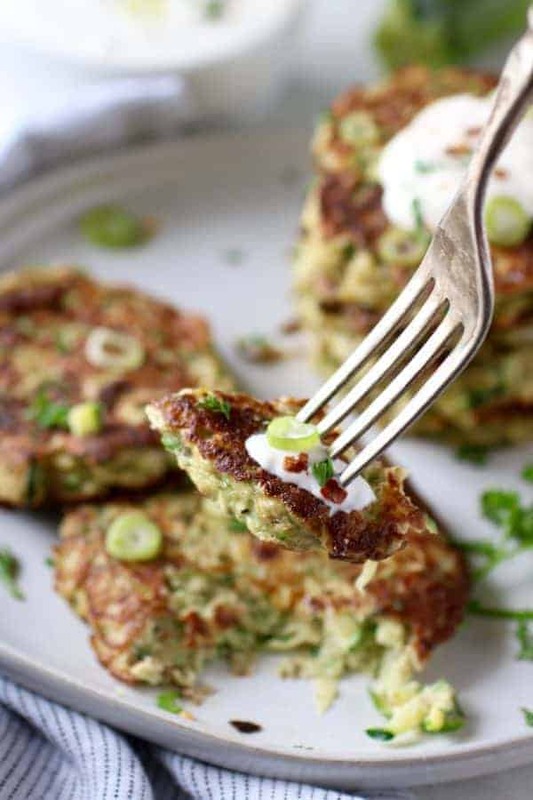 Zucchini Fritters are perfect for breakfast served along side of your favorite sausage and some berries. I also like to use them in place of a bun and sandwich one of our juicy grilled bacon burgers between two fritters. The key to the crisp. 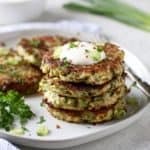 If you desire oh-so-crispy Zucchini Fritters, you won’t want to skip step number one of the instructions which is to sweat the zucchini and squeeze out as much liquid as possible. This is key! Additionally, making sure the ghee (or butter) is hot and sizzles will also help to crisp up the fritters. 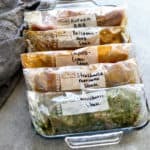 Meal prep and freezer-friendly for the win! We love meal prep Sunday. Well…we don’t always love it in the moment, but after the fact, we do like having food prepared for the week ahead! 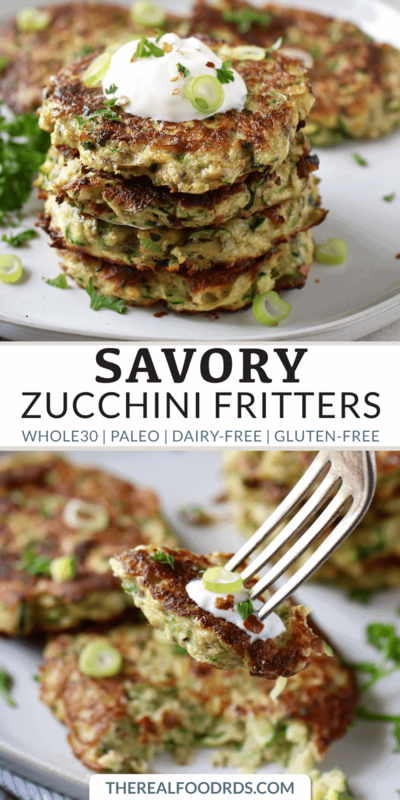 Savory Zucchini Fritters are perfect for meal prep and are freezer-friendly, too. In the instructions, I share the best way to store and reheat them. Now it’s your turn! What’s your favorite way for using up zucchini? Looking for more zucchini recipes? Try our Zucchini Turkey Meatballs, Italian-Sausage Stuffed Zucchini Boats, Spicy Asian Zucchini Noodles and Double Chocolate Zucchini Muffins. Zucchini season has arrived! 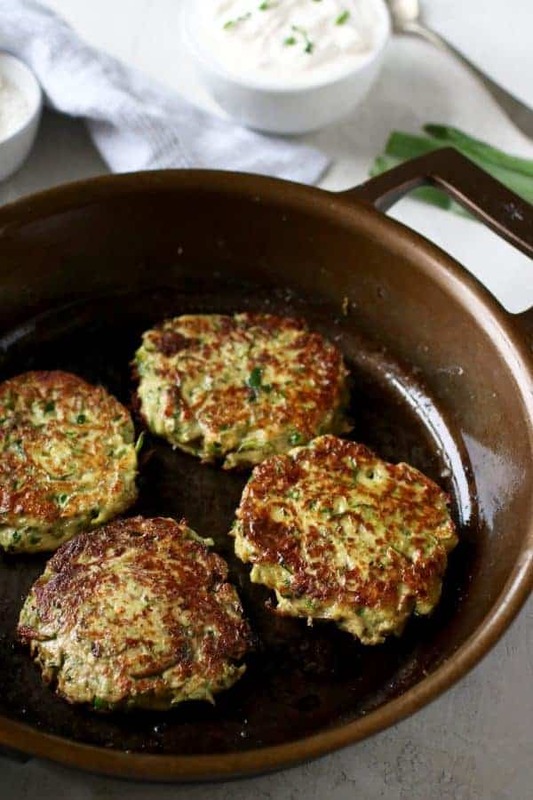 These Savory Zucchini Fritters will make a tasty addition to your zucchini recipe collections. They’re crispy, they’re flavorful and they’re Whole30 & Paleo-friendly! 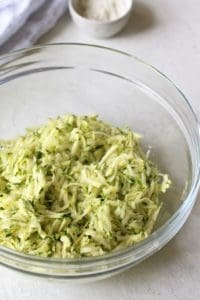 In a bowl, place the shredded zucchini and 1/2 tsp. sea salt. Stir gently and let set for 10 minutes to allow zucchini to sweat. 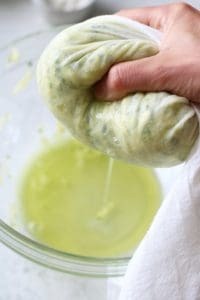 After the 10 minutes, transfer the zucchini to a flour sack towel, paper towel, cheesecloth or nut milk bag. Squeeze as much liquid out as you possibly can. Use those muscles! This step is important and if skipped you may end up with soggy fritters. 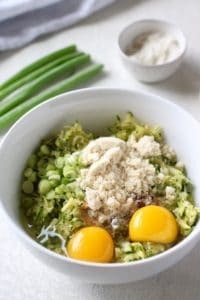 While the zucchini is “sweating,” in another bowl combine the eggs, green onions, Italian seasoning, garlic powder, crushed red pepper, additional sea salt, black pepper and flour. Place a medium/large skillet on the stove over medium heat. Add ghee to the skillet. Once hot (make sure the ghee is hot and sizzles when you add the batter) drop 1/4 cup portions of the zucchini mixture onto the pan. Press down gently so they’re about 1/2-inch thick. Cook on each side for 3-5 minutes. Flip carefully so they don’t fall apart. When done, transfer to a wire rack or plate lined with a paper towel. Repeat until zucchini mixture is gone, adding more ghee to the pan between each batch. Serve with a dollop of sour cream (not Whole3o) or a drizzle of our paleo ranch. Top with sliced green onion and a pinch of crush red pepper for kick. Add additional sea salt and pepper to taste. To Store: Store fritters in the fridge in an airtight container for up to 5 days. To Freeze: Layer cooled fritters in an airtight container separating each row with parchment paper. Freeze for up to 3 months. To Reheat: Fritters can easily be reheated, frozen or thawed, in a skillet over medium heat. Add a teaspoon of ghee to the skillet heat and then add the fritters to the pan to reheat. Add more ghee as needed. You can also reheat fritters in the oven. Temp set at 375 degrees F. Time will vary depending on whether the fritters are being reheated from frozen or thawed. This looks so good! 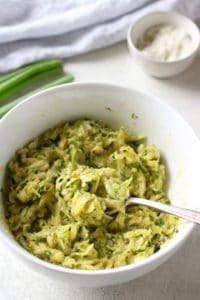 My favorite way to have zucchini is to use it as a replacement for noodles. I put tomato sauce and meatballs over the zoodles. Yum! All great ways to use Zucchini! 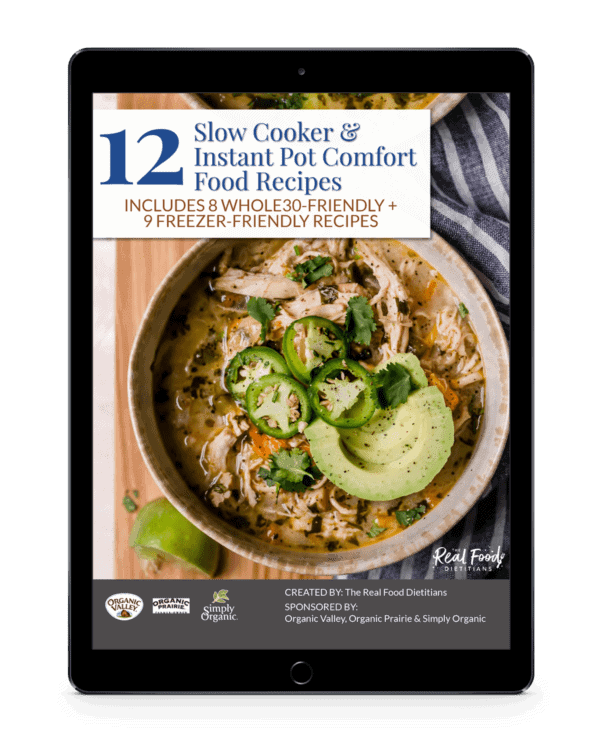 I have made several of your recipes and always love them: Slow Cooker Chicken Corn Chowder, Zucchini Fritters, Egg Roll Bowl and many others. Thanks so much!! So I just found out I have an allergy to eggs! what would you replace that with? I’m so sorry to hear you’re allergic to eggs. I can totally relate! 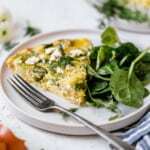 Unfortunately, in recipes like these, it’s hard to replace the eggs since they play such an important role as a binder. 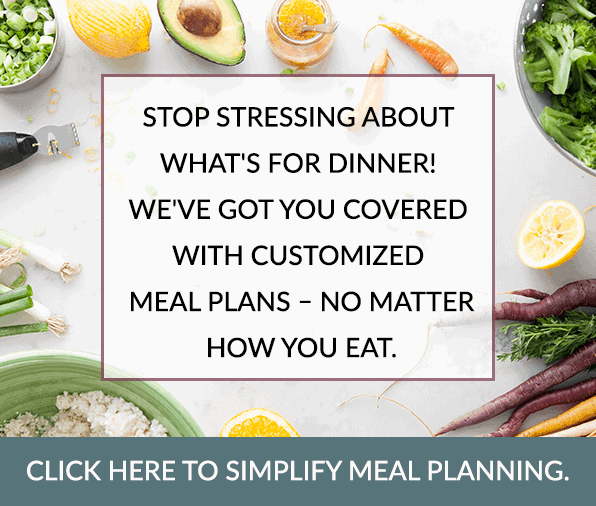 You could try adding leftover mashed potatoes though you’ll have lower protein and higher carb end product and a slightly different mouthfeel. 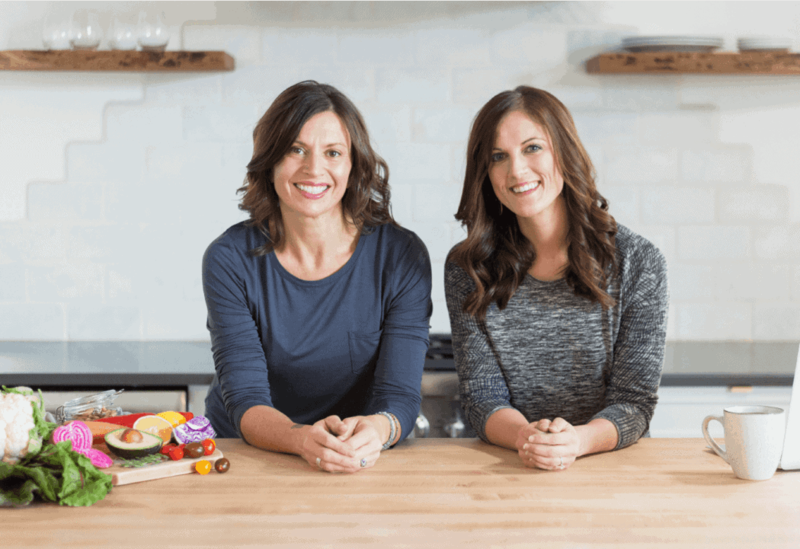 I’m sorry I couldn’t be more help – I’d also love to try them if it weren’t for my own egg allergy! So yummy! Making these for the second time tonight for Meatless Monday. Next time I’m going to double it! Thank you for a tasty dinner! Instead of the Italian seasoning, I add Old Bay seasoning that I mix together that is whole30compliant and it tastes like a faux crab cake! I found the recipe in an old church recipe book when my husband and I first got married and I’ve been making them for 20 years to help use up loads of zucchini every fall! Love the idea of adding Old Bay seasoning! I just made this zucchini fritters and they are absolutely delicious. The red flakes and Italian seasoning just makes them. I’m having them for lunch with sweets potatoes and onions and a little sausage patty. 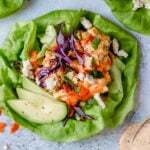 I’m in my second week of Whole30 and was happy to find your recipe. I was just wondering, didn’t see till later, that there are 3grams of sugar, where does it come from? Your lunch sounds amazing! We’re so happy you found us. 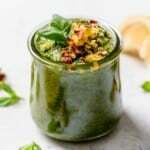 The sugars you see in the nutrition information is from vegetables (as all veggies contain naturally occurring sugars) rather than any added sugars. Hope that helps! 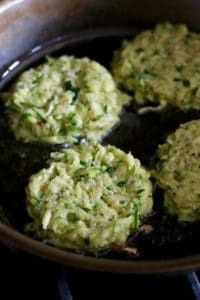 Hello, Could these zucchini fritters be baked instead of frying? We have not tested a baked version of this recipe. If you give it a try, we’d love to hear how they turn out. Thank you for your response. I will let you know how they come out baked. 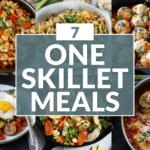 Do you know if it’d be a fairly easy substitute to do these with sweet potatoes instead of zucchini? I’m looking for something I can take with me to a sporting event that’s compliant and portable. I can’t seem to find a recipe for this type of thing using sweet potatoes! Hi Katie! You could sure try and if you do, we’d love to hear how they turn out! I believe they would turn out! I made these and they are really good! I didn’t have green onions so I substituted them with 1/2 teaspoon of onion powder. Next time I will try making them with green onions. Thanks for such a yummy recipe! Do you think yellow (summer) squash would work? I only had 1 Zucchini and 1 yellow (summer) squash and it worked and was yummy. I did add another 1/8 of a cup flour (I used coconut). Thank you for this recipe.